Americans eat too many calories and not enough nutrient-dense foods, says the U.S. Department of Agriculture. 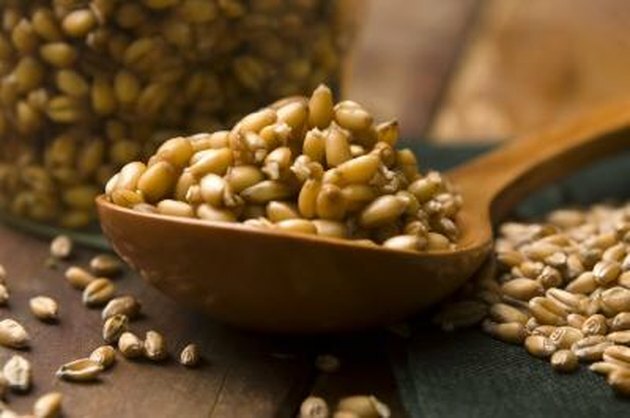 As the center of the wheat seed, wheat germ is a highly concentrated source of nutrients that can help you meet your nutrient needs. However, wheat germ may not be appropriate for all diets. Knowing the benefits and side effects of wheat germ can help you determine its role in your diet. Wheat germ is a nutrient rich food, acting as a good source of some of the B vitamins, phosphorus, zinc, iron, selenium and potassium. A 2-tbsp. serving of crude wheat germ contains 0.27 mg of thiamin, 0.9 mg of niacin, 40 mcg of folate, 121 mg of phosphorus, 0.9 mg of iron, 1.7 mg of zinc, 11.4 mg of selenium and 128 mg of potassium. Adequate intakes of folate support heart health and prevent neural tube defects in children. The B vitamins work together to help metabolize the food you eat into energy. Iron keeps your blood oxygenated. Phosphorus is important for bone health. Zinc promotes wound healing. As an antioxidant, selenium protects cells from oxidation. Eating potassium rich foods can help lower blood pressure, according to the American Heart Association. In addition to being a good source of vitamins and minerals, wheat germ is also a good source of fiber. A 2-tbsp. serving contains 1.9 g of fiber, the same amount of fiber in one slice of whole wheat bread. Fiber offers a number of health benefits. Including more fiber in your diet improves satiety, aiding in weight management. Fiber in food also improves bowel movements and alleviates constipation. It can also reduce blood cholesterol levels. Wheat germ is also a good source of protein. A 2-tbsp. serving contains 3.3 g of protein. By comparison, a 1-oz. serving of chicken contains 7 g of protein. Your body uses the protein in the food you eat to help preserve lean body mass, make new cells and keep your immune system healthy. As a form of wheat, wheat germ contains the gluten protein. If you have celiac disease, you need to eliminate foods containing gluten from your diet. Eating gluten causes your body's immune system to attack your gastrointestinal tract, which can lead to malabsorption and malnutrition. While wheat germ is a nutrient-rich food, it is also calorie dense. A 2-tbsp. serving contains 52 calories. By comparison, 1 cup of carrot sticks contains 50 calories. When using wheat germ to increase your nutrient intake, pay attention to your other food calories to keep them in check. Eating too many calories, even healthy ones, can lead to weight gain. How Much Chia Seed Should Be Eaten?